In Irish Gaelic Maeve means she who intoxicates, and indeed Queen Maeve, or Mab, the Queen of the fairies in English traditon had legendary magical power. 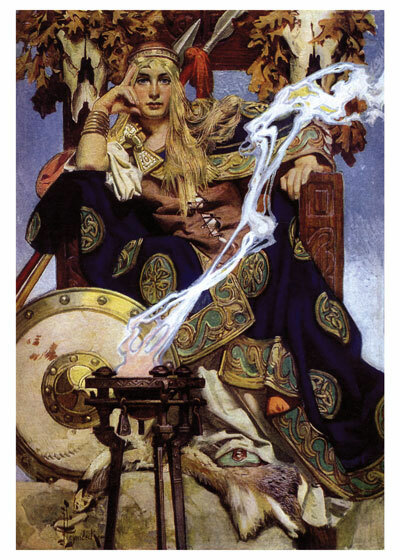 In Irish Gaelic Maeve means she who intoxicates, and indeed Queen Maeve, or Mab, the Queen of the fairies in English traditon had legendary magical power. This image of her by the wonderful early 20th century artist beautifully portrays her majesty and power. J.C.Leyendecker was one of a pair of brothers who were very important in magazine illustration in the early part of the 20th century. J.C. created the Arrow Man, a sophistocated and virile man who represented an ideal of well dressed young manhood, having bought, of course, an Arrow shirt.